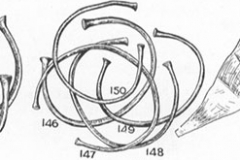 “Why this vast number of gold ornaments should have been collected together and deposited…is a problem to which the present writer feels that he can contribute no explanation sufficiently adequate to exclude other possibilities…Some archaeologists may consider that the ornaments were either:- The spoils of a vanquished people; or a royal tribute; or a votive offering. 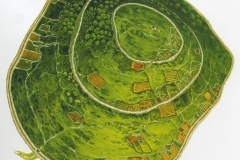 Drag within the image to view the upper cashel of Mooghaun Hillfort in virtual reality. 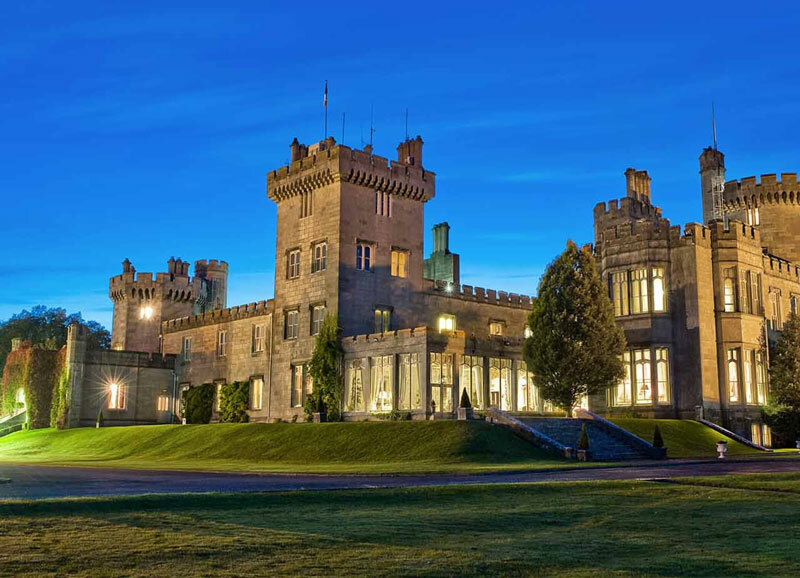 Once the palatial residence of the fabled O’Brien family, Dromoland Castle is now a luxury hotel for superstars, presidents, and splurging wannabe oligarchs, with a championship golf course within its forested 538-hectare (1,330-acre) estate.2 The present structure was built by the 4th Baronet Inchiquin in 1835. 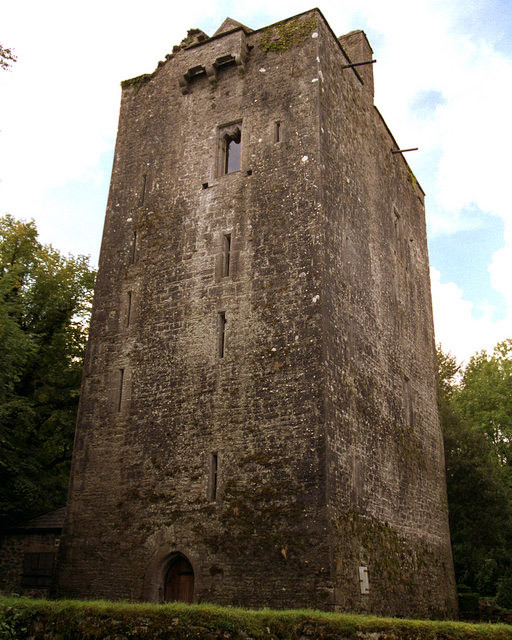 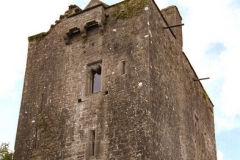 Some 1.3 km (.8 mi) to the E is the restored tower of an earlier bastion, Mooghaun Castle,3 perhaps projecting as much wealth and political strength in the 15th century as Dromoland was to claim 300 years later. 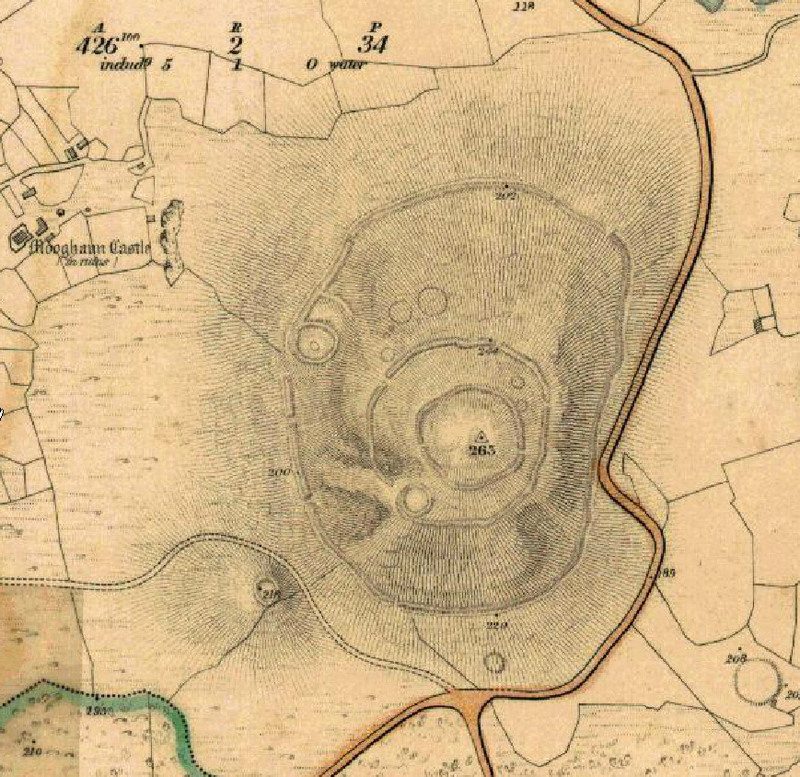 But another 400 m (437 yds) SW of Mooghaun Castle, and occupying an entire hill with its three massive concentric walls, is Mooghaun Hillfort. 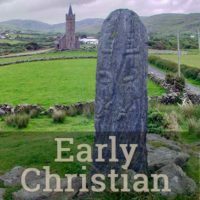 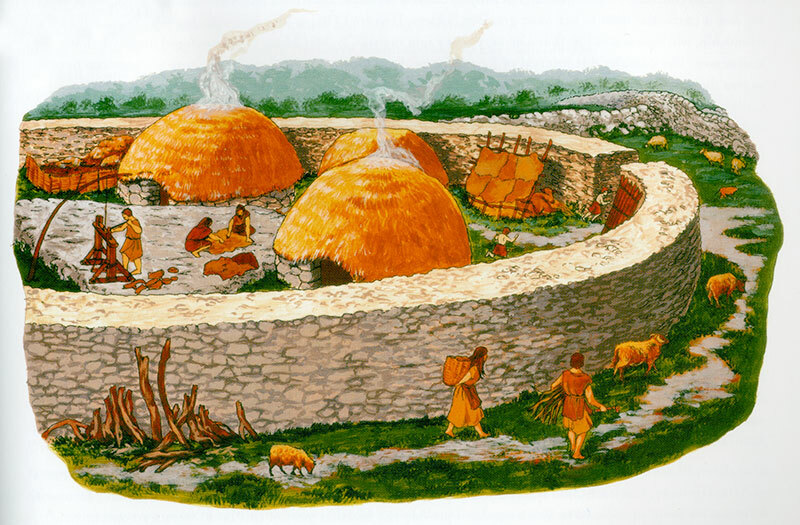 This complex and extensive site, the largest of its type in Ireland, was a prehistoric walled village—the bastion of a local king and his extended community of aristocrats and subjects. 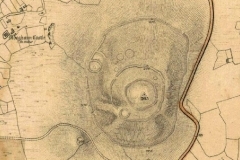 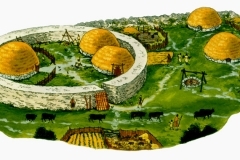 Mooghaun Hillfort may have represented in the Late Bronze Age a greater political strength and a more significant economic power than either Mooghaun or Dromoland Castles did in their own ages of ascendency. 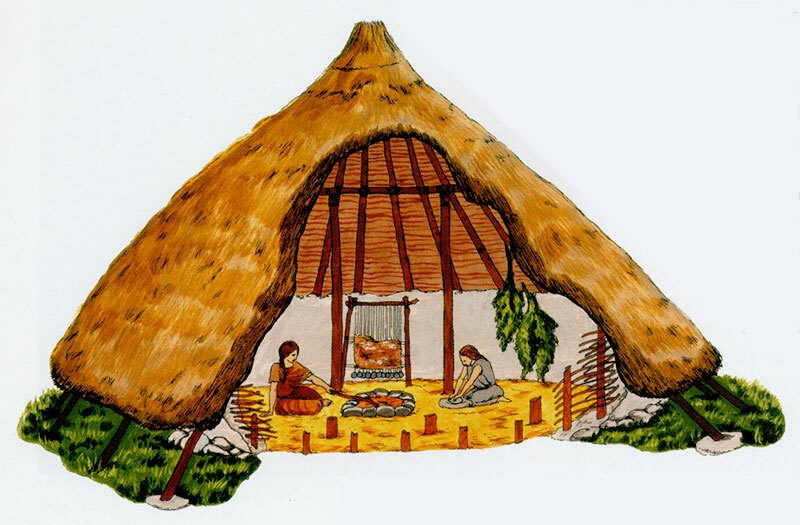 4,200 Years in the Mooghaun Neighbourhood. 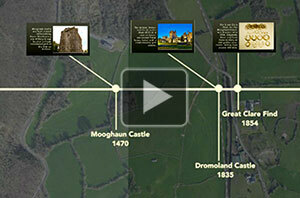 Click for an interactive timeline. 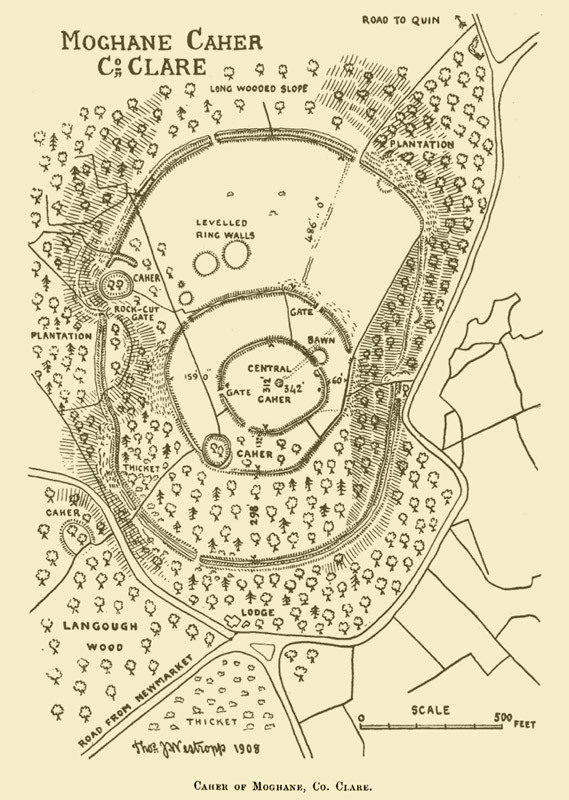 Mooghaun Hillfort encloses within its triple walls an area of more than 11 hectares (27 acres). 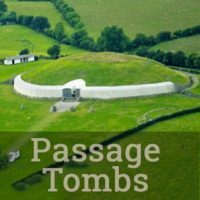 At the top of its central enclosure it rises 92 m (300 ft) above the plain, and before the recent timber growth offered a strategically important view up the estuaries of both the Shannon and the Fergus, a prehistoric route into the interior of the country. 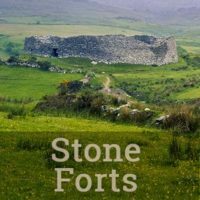 Its ramparts are 6-m (20-ft) thick in places, but, their stones having long since been borrowed for the cashels built much later, do not stand today as tall as they were after their construction around 950 BCE.4 The outermost ring of the fort stretches an astounding 1.37 km (.85 mi) around the perimeter. 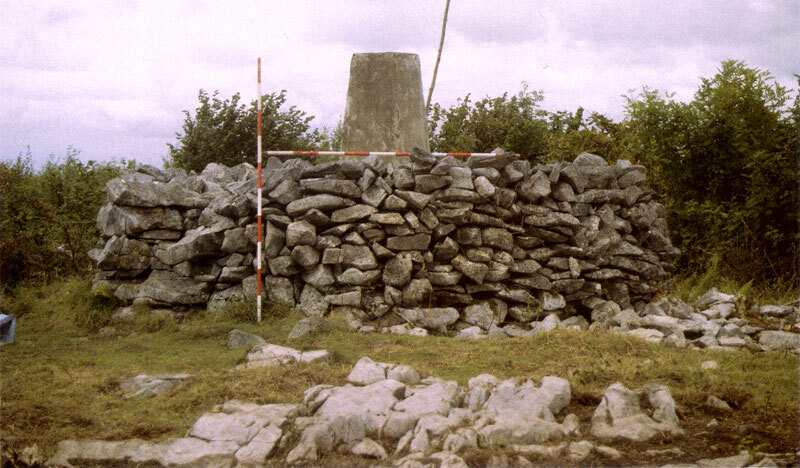 About 750 m (820 yds) NE of Mooghaun Hillfort, in March of 1854, workers constructing the Limerick and Ennis Railway were instructed to level a spot near the right-of-way. 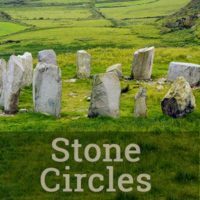 Thrusting their spades into the sod, they uncovered a rude stone box containing a jumble of twisted metallic objects about 46 cm (18 in) beneath the surface. 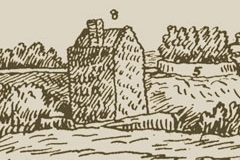 A few pieces were nonchalantly tossed into the nearby waters before someone breathlessly exclaimed that the dirt-encrusted metal was actually a treasure-trove of gold. 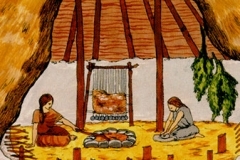 This illustration of a Late Bronze Age domestic scene at Mooghaun Hillfort was created by David Hill for the 1999 booklet he and archaeologist Eoin Grogan produced for the Discovery Programme. 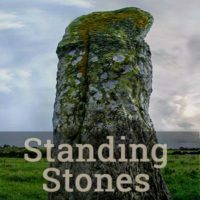 See others in the gallery below. 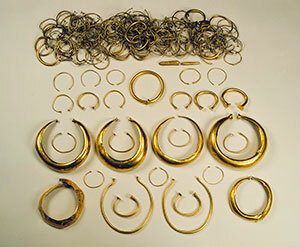 The golden ornaments, perhaps several hundred in number, came to be known as the Mooghaun Hoard or the Great Clare Find.7 Dating from around 800 BCE, this was the largest hoard of Bronze Age gold objects ever found in Western Europe. 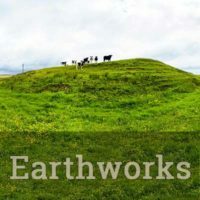 Most scholars would agree that the treasure trove must be connected in some way to Mooghaun Hillfort.8 How they came to be deposited in this remote spot the author of the 1917 quotation at the top of this page considered a topic unworthy of discussion. 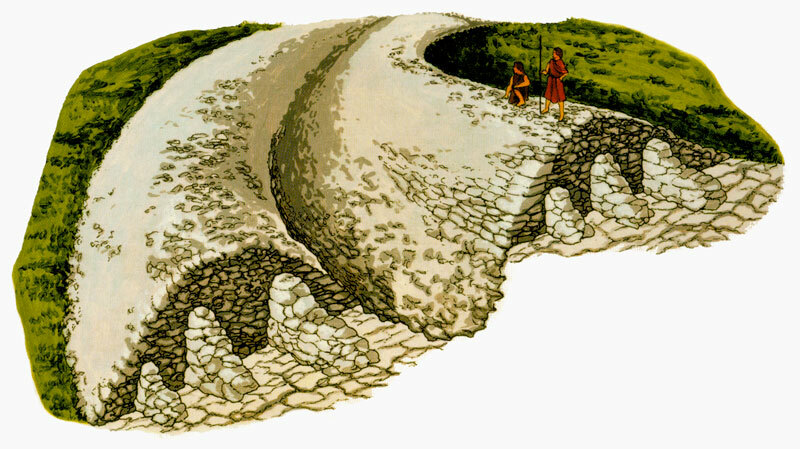 However, in the same spirit in which James McPherson revealed the writings of the ancient Celtic bard Ossian in his poetic “translations” of the 1760s, we will herewith propose three contradictory scenarios, each in the form of a first-person account describing how the Great Clare Find came to be taken from the “Hill of the Three Walls” (Mooghaun Hillfort) and hidden in the spot where it was to be discovered by the lucky navvies in 1854. 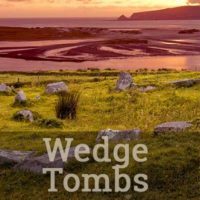 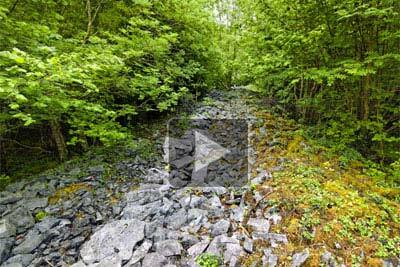 Click to explore one of Mooghaun Hillfort's ramparts in virtual reality. 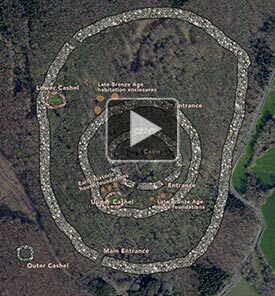 Click for an animated aerial view. 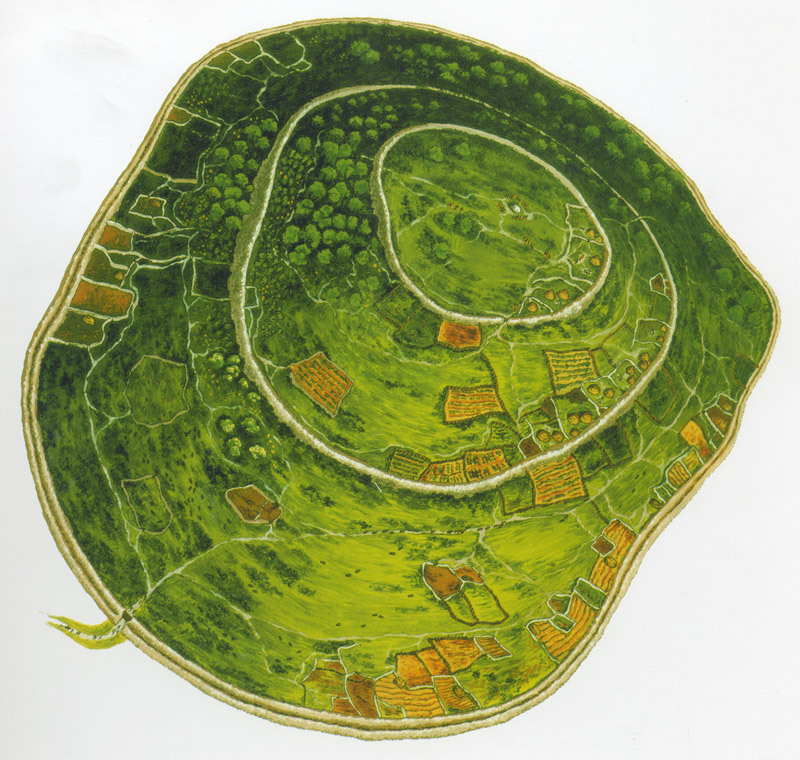 Click on the image above to see it in high resolution. 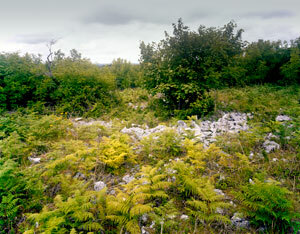 This image of one of the Mooghaun Hillfort walls was made in 1979, prior to the fort’s excavation and landscaping project (1992-1995). 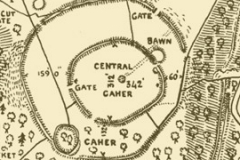 Just as we cannot know the nature of the ceremonial occasions Mooghaun hosted at the height of its powers, we have no way of knowing why or when such a powerful social force dissipated and ultimately saw its commanding ramparts tumbled into a forlorn and fern-enveloped ruin. Was there a change in agricultural fortunes that resulted in starvation? 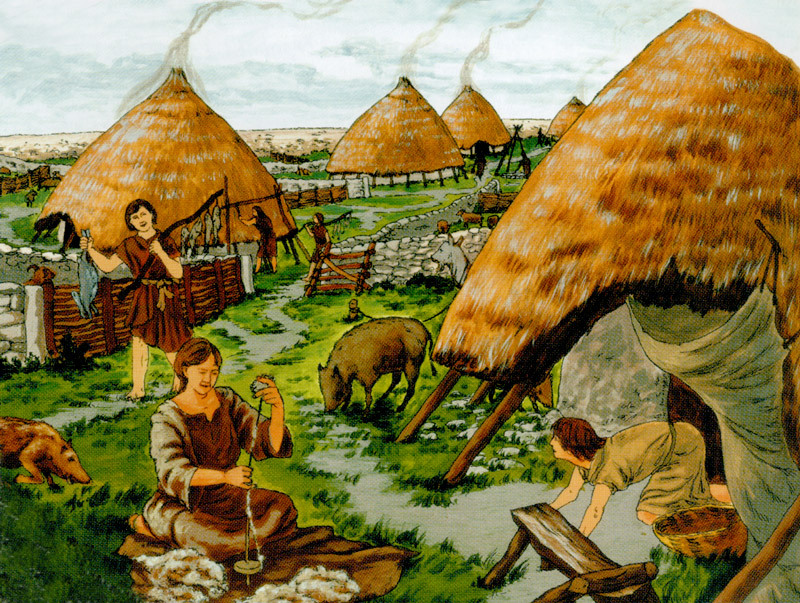 Was the community slaughtered by an competing tribe, or a foreign invader? 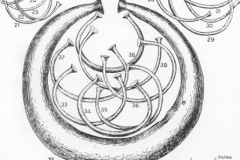 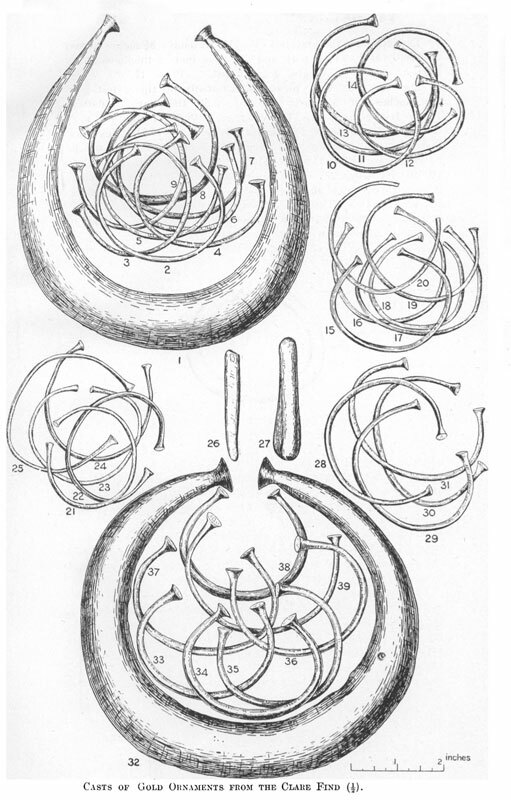 Could the discovery in 1854 of the fabulous Mooghaun Hoard of golden ornaments less than a kilometer away provide an answer, or several (see above)? 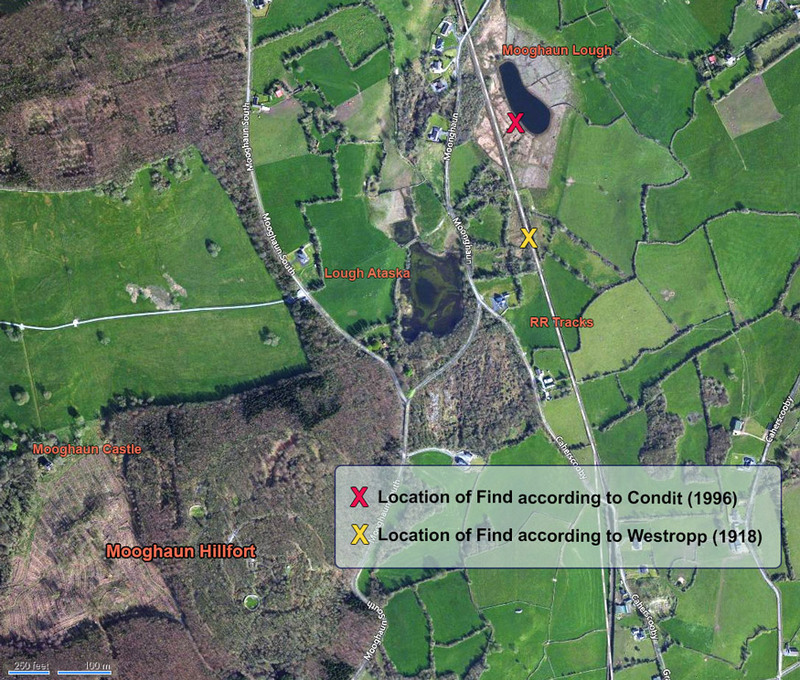 Neither of the “X” spots on our map fully supports the view that the Mooghaun Hoard was a votive offering thrown into a body of water, intended to appease or honor a supernatural entity, and never intended to be recovered. 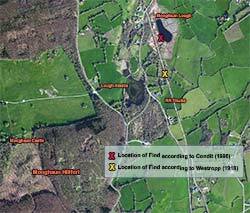 It is known that the level of Mooghaun Lough was considerably higher before an early 20th-century drainage project, thus making it possible that the construction of the railway in 1854 took it through land that was submerged during the Late Bronze Age. 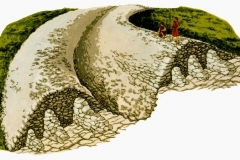 However, the placement of the hoard inside a stone box might have been difficult to accomplish under the surface of the water. 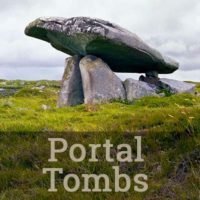 Furthermore why would these valuable objects be placed into a prominent repository, where they could be easily recovered, if the intent was to send them off into the supernatural? 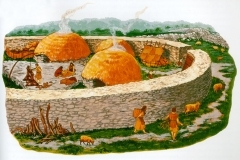 Elsewhere in Ireland, it is widely accepted that the artificial pool called The King’s Stables, near Navan in Co. Armagh, was created by a water cult for the ritual deposit of votive objects. The total number of objects known to survive from the Mooghaun Hoard was in 1997 increased by one when a visitor at the National Museum of Ireland, after studying the gold ornaments in the display case, mentioned to an official that a friend of hers had a bracelet from the Hoard, kept in the family for generations, regularly polished, and worn as jewelry. 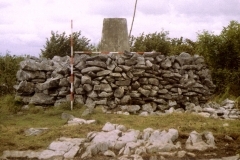 The piece was acquired by the Museum and is now on display. 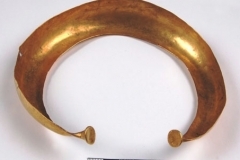 In the gallery below you can compare this bracelet with a naturally tarnished gold collar from the Hoard, now in the collection of the British Museum. 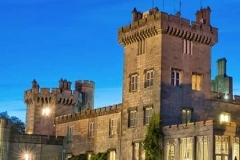 There were other bracelets mentioned in the historical record as being in the possession of the Inichiquins of Dromoland Castle. 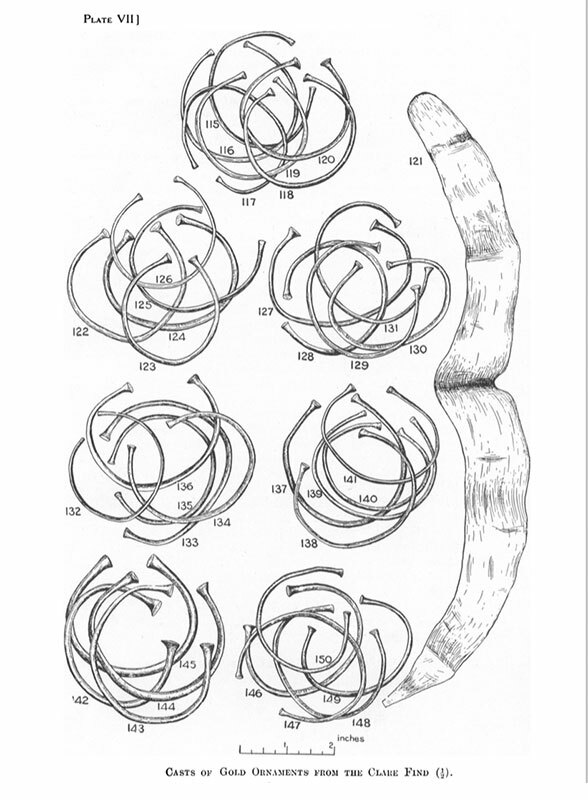 While most of these are now apparently lost, it seems that two Mooghaun bracelets were buried with their owner.29 Will an archaeologist in the distant future see this as an opportunity for excavation?